The majority of bee species are not the familiar fuzzy bumble bees or the yellow banded honey bees that live in large colonies. Most of the different kinds of bees are solitary and range in size from just a few millimeters to 1.5 inches in body length. In the vicinity of the small city of Carlinville in Macoupin county, Illinois, an astonishing 228 different species of bees have been recorded. Scientists estimate that in all of the USA at least 3,500 different species of bees exist. 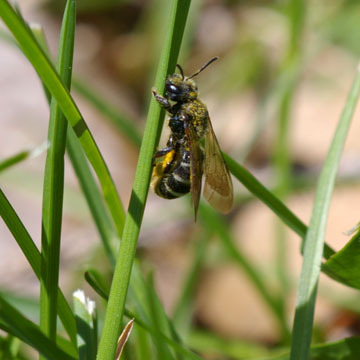 Solitary bees, unlike hive-inhabiting bumble or honey bees, nest in burrows and tunnels in the ground, in hollow plant stems, or in tree holes. Their nests are founded by a single female who, after mating, will provision brood cells with a diet consisting of plant pollen and nectar before a single egg is laid in each cell. Once a nest is filled with a series of cells and the eggs are laid, the mother bee takes off and leaves her brood to develop and emerge on their own the following season. Emergence of new bees after having passed the winter as pupae often coincide with the flowering of favorite plants during the next spring or summer. 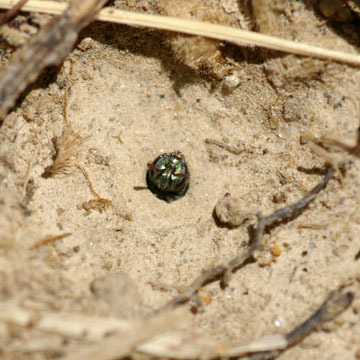 The provision that the solitary female bee gathers for her offspring is often very specific for a particular bee species. 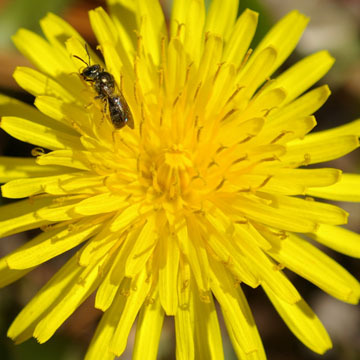 Many of the solitary bees are specialists upon one or a few closely related species of plants and can only provision their brood with specific kinds of pollen. Andrena violae, described from Carlinville, is an example of such specialist bee as it will only gather pollen from violets (Viola). Andrena violae is therefore only flying around during April and May when the violets are flowering. Some bees are specialists on plant matter other than pollen. Around Illinois the rare Macropis bees are found to visit and pollinate native loosestrifes (Lysimachia). Their visits are unusual as they do not gather pollen as most other bees, but rather floral oils or fats which they can use for sealing or provisioning in their nests. While most bees visit flowers to gather pollen for their provisions or occasionally to fuel up on nectar for flying around, some bees have circumvented the laborious construction of nests. Instead these bees, called cucko bees or cleptoparasites, will place their eggs in the nests of other bees. Many of the cleptoparasitic bees are wasp-like in form, for example Nomada that mainly use Andrena as hosts. 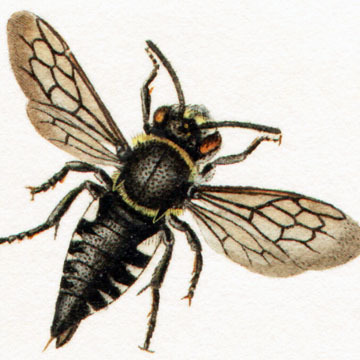 The illustrated Coelioxys is a parasite of leaf-cutter bees (Megachile). All of these native bees rarely get disturbed and will not sting unless stepped on by accident. Due to their specific floral associations and high efficiency in pollination, solitary bees are extremely important pollinators of native wild flowers and certain crops such as cucumber, apple, tomatoes, and clover. Are there any common native species around here? 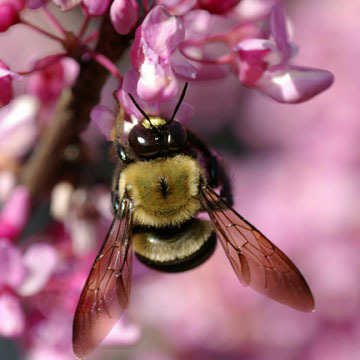 The bumble bee "look alike", the eastern carpenter bee (Xylocopa virginica), is abundant and encountered throughout the Eastern US and Canada. Nests are usually excavated in dry hardwoods, often in wood dwellings around houses where they may constitute minor pests. Their activity can be reduced by painting the affected tree, or they can be encouraged to move by presenting alternative nesting sites. These buzzing bees are as frequent as bumble bees throughout the summer in some urban areas, including downtown Champaign, Illinois. Many gardeners are familiar with the leaf-cutting bees in the genus Megachile. They cut small perfect semi-circular holes out of the edges of leaves and petals with a preference for roses. The pieces are used for lining their brood cells while constructing the nest. 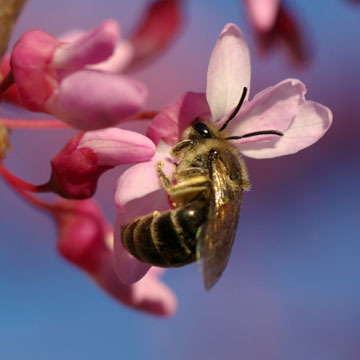 During the last weeks of March, many forested and urban forested areas of Illinois witness a boost of spring bees. In particular the emergence of thousands of the vernal plasterer bee, Colletes inaequalis, in aggregations around the state is impressive. They come out in massive numbers just in time for the flowering of the first large trees, including maple (Acer). While it is a joy to see all these bees emerge as a sign of spring, home-owners may be concerned about large plasterer bee aggregations in their lawns. Usually the planting of a dense ground cover, such as tall rye grass, ivy, or shrubs, will discourage future nesting from the bees and prevent the use of pesticides. How do I identify a solitary bee? BeeSpotter does not focus on solitary bee species. There are a great number of species and they often require a closer examination than just a photograph to be identified to species. Additional information on the solitary bees can be found at the Discover Life website or through the BugGuide's extensive collection of photographs of bees, representing all of the more common groups from our local Illinois bee fauna. Michener, C.D. (2007) The bees of the world, second edition Johns Hopkins University Press, Baltimore. Michener, C.D., McGinley, R.J., & Danforth, B.N. (1994) The bee genera of North and Central America (Hymenoptera: Apoidea) Smithsonian Institution, Washington. Packer, L., Genaro, J.A., & Sheffield, C.S. (2007) The bee genera of eastern Canada. Canadian Journal of Arthropod Identification, 3, 1-33.